In Arabidopsis, development during flowering is coordinated by transport of the hormone auxin mediated by polar-localized PIN-FORMED1 (AtPIN1). However Arabidopsis has lost a PIN clade sister to AtPIN1, Sister-of-PIN1 (SoPIN1), which is conserved in flowering plants. We previously proposed that the AtPIN1 organ initiation and vein patterning functions are split between the SoPIN1 and PIN1 clades in grasses. Here we show that in the grass Brachypodium sopin1 mutants have organ initiation defects similar to Arabidopsis atpin1, while loss of PIN1 function in Brachypodium has little effect on organ initiation but alters stem growth. Heterologous expression of Brachypodium SoPIN1 and PIN1b in Arabidopsis provides further evidence of functional specificity. SoPIN1 but not PIN1b can mediate flower formation in null atpin1 mutants, although both can complement a missense allele. The behavior of SoPIN1 and PIN1b in Arabidopsis illustrates how membrane and tissue-level accumulation, transport activity, and interaction contribute to PIN functional specificity. The plant hormone auxin is an essential mobile signal controlling growth and patterning throughout plant development (Leyser, 2010). Auxin can passively enter cells triggering a vast array of downstream signaling events (Wang and Estelle, 2014), but it cannot easily exit the cell without active transport (Raven, 1975; Rubery and Sheldrake, 1974). As a result, directional efflux mediated by the polar-localized PIN-FORMED (PIN) efflux carriers can organize auxin flows and accumulation patterns, creating concentration maxima and paths of transport that regulate growth, position organs and pattern tissues (Adamowski and Friml, 2015). Because auxin itself feeds back to regulate PIN-mediated transport both transcriptionally and post-transcriptionally (Leyser, 2006), the transport system shows remarkable robustness and plasticity. For example compensatory changes in PIN abundance between PIN family members can mitigate PIN loss-of-function mutant phenotypes (Blilou et al., 2005; Paponov et al., 2005; Vieten et al., 2005), environmental inputs can trigger tissue-level changes in PIN abundance and polarity leading to altered plant growth (Habets and Offringa, 2014), and auxin transport paths can be reorganized in response to injury (Sauer et al., 2006; Xu et al., 2006) or spontaneously in tissue culture (Gordon et al., 2007). The self-organizing properties of the auxin transport system gives this patterning mechanism extraordinary versatility and allows it to coordinate both local and long-range communication in plants. The correct initiation and positioning of organs (leaves, flowers, stems) in the growing tip, or shoot apical meristem, of Arabidopsis thaliana (Arabidopsis) plants requires the action of the PIN-FORMED1 (AtPIN1) auxin efflux carrier (Okada et al., 1991). AtPIN1 is targeted to the plasma membrane and polarized in cells (Gälweiler et al., 1998). In the meristem epidermis polarization of AtPIN1 in neighboring cells converges around the initiation sites of new organs, suggesting that polarized AtPIN1 concentrates auxin into local maxima causing organ initiation (Benková et al., 2003; Heisler et al., 2005; Reinhardt et al., 2003). Accordingly in atpin1 loss-of-function mutants or if auxin transport is pharmacologically inhibited, organ initiation is aborted but it can be rescued with local auxin application to the meristem flank (Reinhardt et al., 2003; Reinhardt et al., 2000). Organ initiation in atpin1 mutants can also be rescued with epidermal-specific AtPIN1 expression (Bilsborough et al., 2011) and reducing AtPIN1 function specifically in the epidermis compromises organ positioning and initiation (Kierzkowski et al., 2013), demonstrating the importance of convergent AtPIN1 polarization in the epidermis during organ formation. The recurrent formation of AtPIN1 convergence points surrounding auxin maxima in the meristem epidermis has been the focus of several computational models that attempt to explain how auxin feeds back on its own transport via AtPIN1 to concentrate auxin and control organ spacing (Abley et al., 2016; Bayer et al., 2009; Bhatia et al., 2016; Heisler et al., 2010; Jönsson et al., 2006; Smith et al., 2006; Stoma et al., 2008). However AtPIN1 is also expressed during the patterning of the vascular strands formed coincident with organ positioning, and in these sub-epidermal cells AtPIN1 is polarized rootward away from the presumed auxin maxima, suggesting that AtPIN1 polarity with respect to auxin concentration may vary across tissues or over developmental time (Bayer et al., 2009). Indeed AtPIN1 has several functions post organ initiation that are not necessarily associated with convergent polarization patterns (Gälweiler et al., 1998; Scarpella et al., 2006). AtPIN1 is not required for organ formation during the vegetative phase. Mutants lacking AtPIN1 form leaves but they are misplaced and have severe morphological and vascular defects similar to those observed upon pharmacological inhibition of auxin transport, suggesting an important role for AtPIN1 in post-initiation morphogenesis and vein patterning in leaves (Guenot et al., 2012; Sawchuk et al., 2013; Verna et al., 2015). Furthermore in mature tissues AtPIN1 is polarized rootward in vascular-associated cells and is required for efficient long distance transport of auxin down the shoot in the polar auxin transport stream and this has been proposed to play an important role in the regulation of shoot branching (Bennett et al., 2016; 2006; Gälweiler et al., 1998; Shinohara et al., 2013). Mutations in other PIN family members in combination with atpin1 mutants suggest further functions in embryo development, root development and during plant growth responses to light and gravity (Leyser, 2005). Unfortunately the myriad roles for AtPIN1 during inflorescence development are genetically obscured by the severity of atpin1 organ initiation defects. We previously showed that all sampled flowering plants outside of the Brassicacea family have a clade of PIN proteins phylogenetically sister to the PIN1 clade (The Sister-of-PIN1 or SoPIN1 clade), while Arabidopsis and other Brassicacea species have lost this clade (O'Connor et al., 2014). During initiation of the lemma, a leaf-like floral organ in the grass Brachypodium distachyon (Brachypodium), which has both PIN1 and SoPIN1 clades, SoPIN1 is highly expressed in the epidermis, polarizes towards presumed auxin maxima, and forms convergent polarization patterns, suggesting a role in creating the auxin maxima required for organ initiation in the shoot. In contrast, the duplicate Brachypodium PIN1 clade members, PIN1a and PIN1b, are not highly expressed in the epidermis, orient away from presumed auxin maxima and are primarily expressed during patterning in the sub-epidermal tissues. Thus the combined expression domains and polarization behaviors of SoPIN1, PIN1a, and PIN1b in Brachypodium largely recapitulate those observed for AtPIN1 alone in Arabidopsis. The dynamic localization and polarization patterns of the Brachypodium SoPIN1 and PIN1 clades can be modeled with two different polarization modes with respect to auxin. PIN behaviors can be captured by a model in which SoPIN1 polarizes ‘up-the-gradient’ towards the neighboring cell with the highest auxin concentration, while PIN1a and PIN1b polarize ‘with-the-flux’ accumulating in the membrane with the highest net auxin efflux (O'Connor et al., 2014). Both polarization modes were previously applied to AtPIN1 in order to capture the switch in polarity observed during organ initiation and vein patterning, first orienting toward the auxin maximum during convergence point formation, then orienting away from the maximum below the epidermis during vein patterning (Bayer et al., 2009). These localization and modeling results suggest that in most angiosperm species the organ placement and vascular patterning functions attributed to AtPIN1 in Arabidopsis are split between the PIN1 and SoPIN1 clades and that these two clades have different polarization properties with respect to auxin. Exploring this hypothesis, here we present the functional analysis of both the SoPIN1 and PIN1 protein clades in Brachypodium, a species with the canonical two-clade family structure. We show that SoPIN1 and the PIN1 clade members PIN1a and PIN1b have different functions during Brachypodium development, with SoPIN1 being required for organ initiation during the flowering phase, and PIN1a and PIN1b regulating stem growth. Using heterologous expression in Arabidopsis we show that the SoPIN1 and PIN1b proteins have different accumulation, polarization, and transport behaviors that result in different functional properties independent of transcriptional context. In addition to elucidating several ways in which PIN family members can be functionally distinct, these results suggest that the Arabidopsis AtPIN1 protein represents an example of an evolutionary phenomenon the opposite of subfunctionalisation in which protein functions are amalgamated into a single protein rather than diversified amongst paralogs. AtPIN1 has a repertoire of roles and associated polarization behaviors that are distributed among several clades of PIN proteins in most flowering plants. We targeted Brachypodium SoPIN1, PIN1a and PIN1b with gene-specific Clustered Regularly Interspaced Short Palindromic Repeats (CRISPR) and for all three genes recovered independent single base-pair lesions causing frame shifts and premature stop codons (Figure 1A). The wild-type Brachypodium inflorescence meristem normally makes several lateral spikelet meristems (lsm) before producing a terminal spikelet meristem (tsm) (Figure 1B)(Derbyshire and Byrne, 2013). Both lateral and terminal spikelet meristems are consumed in the production of florets (Figure 1D and F). The sopin1-1 inflorescence meristems had severe organ and spikelet branch initiation defects (Figure 1C), which resulted in reduced total whole-plant spikelet number (Figure 1H). When spikelets did form, sopin1-1 spikelet meristems were often devoid of new organs (Figure 1E) and very few recognizable florets were produced (Figure 1I). In support of the sopin1-1 lesion being responsible for these varied inflorescence phenotypes, we complemented inflorescence development and seed set by crossing sopin1-1 to the previously published SoPIN1-Citrine fusion line (Figure 1—figure supplement 1)(O'Connor et al., 2014). The pleotropic defects displayed by sopin1-1 in the inflorescence are remarkably similar to loss-of-function pin1 mutants in Arabidopsis (Okada et al., 1991) and Cardamine hirsuta (Barkoulas et al., 2008). Mutation of SoPIN1 but not PIN1a and PIN1b severely effects organ initiation in Brachypodium. (A) SoPIN1, PIN1a, and PIN1b CRISPR-derived mutant alleles (see Materials and methods). Coding sequences are indicated by grey boxes. Arrowheads indicate CRISPR target sites and are labeled with the type of DNA lesion (C insertion, T insertion, or A deletion). All mutant alleles have frame shifts that result in premature stop codons at the positions indicated. (B–G) Inflorescence phenotypes of CRISPR-derived sopin1-1, pin1a-1, and pin1b-1 mutants. See Figure 2 for whole-plant phenotypes. (B–E) and (G) are scanning electron microscopy (SEM). (B) Immature wild-type (WT) (inbred line Bd21-3) Brachypodium inflorescence with several lateral spikelet meristems (lsm), and a terminal spikelet meristem (tsm). (C) sopin1-1 plants have severe organ initiation defects in the inflorescence. (D) Detail of a wild-type lateral spikelet meristem outlined by a box in (B) showing an immature lemma (l), which is the leaf-like organ that subtends the floral meristem (fm). (E) Detail of barren lateral spikelet meristem outlined by box in (C). (F) Mature inflorescence phenotypes of WT (Inbred Bd21-3), sopin1-1, pin1a-1, pin1b-1, and double pin1a-1/pin1b-1 mutants. The terminal spikelet (ts) of each inflorescence is indicated for comparison. Arrowhead indicates bent internode tissue in pin1b-1. Genotypes for (G–I) are indicated at the bottom of (I). (G) SEM details of representative spikelet meristems. (H) Box-plot of total whole-plant spikelet number at seed-set. (n = 22–53 plants each genotype). Samples with different letters are significantly different from each other (ANOVA, Tukey HSD, p<0.05). See ‘Figure 1H–I Source Data 1’ for source data. (I) Box-plot of the number of florets in each terminal spikelet of the central branch at seed set. (n = 22–53 plants each genotype). Samples with different letters are significantly different from each other (ANOVA, Tukey HSD, p<0.05). See ‘Figure 1H–I Source Data 1’ for source data. (J) Medial confocal Z-section of pZmUbi::DII-Venus (DII) expression in a WT spikelet co-expressing SoPIN1 tagged with Cerulean (a CFP variant) under the native SoPIN1 promoter. Organ primordia are numbered I2, I1, P1 from youngest to oldest. DII is normally degraded at SoPIN1 convergence points in I2 and I1 primordia (asterisks), and in response to auxin treatment (See Figure 1—figure supplement 2). Inset shows color look-up-table for all subsequent PIN images and color look-up-table for DII. (K) Medial confocal Z-section of pZmUbi::DII-Venus expression in a sopin1-1 spikelet meristem. DII degradation does not occur in the periphery of sopin1-1 meristems, and organs fail to initiate (arrow). Scale bars: 100 µm in (B) and (C), 20 µm in (D) and (E), 1 cm in (F), 50 µm each in (G), and 25 µm in (J) and (K). In wild-type spikelet meristems SoPIN1 convergence point formation is coincident with an increase in the auxin signaling reporter DR5 (O'Connor et al., 2014), as well as a decrease in the nuclear auxin response reporter protein DII-Venus (Brunoud et al., 2012) (DII) (Figure 1J), which functions in Brachypodium and is degraded in the presence of auxin in spikelet meristems (Figure 1—figure supplement 2). In sopin1-1 meristems DII accumulation was uniformly high for long stretches of the epidermis and the patterned reduction of DII both in the meristem epidermis and internally failed to occur, suggesting a failure to organize auxin maxima (Figure 1K arrow). In contrast to the severe defects of sopin1-1, organ initiation in pin1a-1 and pin1b-1 single mutants was largely unaffected. The mature inflorescences of both pin1a-1 and pin1b-1 had normal spikelets (Figure 1F) and spikelet meristem morphology was indistinguishable from wild-type (Figure 1G). Mutant pin1a-1 plants appeared visually wild-type but we measured a slight increase in total spikelet number (Figure 1H). Mutant pin1b-1 plants were similar to wild-type with respect to both spikelet and floret numbers (Figure 1H and I) but often had bent apical internodes (Figure 1F arrowhead). While pin1a-1 and pin1b-1 single mutants had no clear organ initiation defects they showed changes in internode length (Figure 2). Plant stature in pin1a-1 mutants was largely indistinguishable from wild-type (Figure 2B) but we measured a small reduction in the length of the I4 internode (Figure 2E). In contrast pin1b-1 plants were easily distinguished from wild-type because of a significant increase in internode length at the base of the plant, resulting in greater overall plant height (Figure 2E). The elongated basal internodes and bent stems of pin1b-1 resulted in a less compact plant architecture compared to the other genotypes (Figure 2C). The increase in basal internode length in pin1b-1 single mutants was rescued by the previously published PIN1b-Citrine fluorescent reporter (O'Connor et al., 2014) (Figure 2—figure supplement 1). PIN1a and PIN1b redundantly control internode growth in Brachypodium. (A–D) Whole-plant phenotypes for WT (Bd21-3), pin1a-1, pin1b-1, and double pin1a-1/pin1b-1 mutants. (E) Stacked bar graph of the length of the first 5 internodes below the inflorescence of the main branch, labeled I1-I5 from top to bottom. Lines connect analogous internodes between genotypes. Analogous internodes with different letters are significantly different from each other (ANOVA, Tukey HSD, p<0.05). I5 internodes were not significantly different between genotypes and are unlabeled. Internode lengths significantly different from WT are indicated by asterisks. (n = 18–51 individuals each genotype) See ‘Figure 2—source data 1' for source data. Scale bars: 1 cm in (A–D). The PIN1a and PIN1b duplication is specific to, but conserved within the grasses (O'Connor et al., 2014). Thus we suspected these two genes would show a degree of genetic redundancy. Indeed pin1a-1/pin1b-1 (pin1a/b) double mutants showed a synergistic phenotype with severely reduced plant height (Figure 2D) resulting primarily from reduced internode growth in the upper internodes (Figure 2E). However, despite loss of both PIN1a and PIN1b function, pin1a/b double mutants made normal spikelet meristems (Figure 1G), had a wild-type total spikelet number (Figure 1H) and showed only a small reduction in floret number in the terminal spikelet (Figure 1I). In addition unlike sopin1-1 plants, pin1a/b double mutants set ample seed. Combined these phenotypes provide further support for functional distinction between the SoPIN1 and PIN1 clades and indicate that while the PIN1 clade is expendable for organ initiation in Brachypodium, it is involved in the regulation of internode growth. During organ formation in the Brachypodium shoot, expression of both SoPIN1 and PIN1b precedes PIN1a, which only accumulates significantly at the sites of vein formation after organs begin to grow (O'Connor et al., 2014). In the earliest stages of initiation prior to the periclinal cell divisions that are the hallmark of morphogenesis, SoPIN1 forms convergent polarization patterns around presumed auxin maxima in the meristem epidermis, while PIN1b is expressed internally and orients away from maxima (O'Connor et al., 2014). Because of their early expression, opposing polarization patterns and their clear single-mutant phenotypes in Brachypodium, we focused on characterizing SoPIN1 and PIN1b as representatives of the SoPIN1 and PIN1 clades. The difference between the sopin1-1 and pin1b-1 phenotypes in Brachypodium could be due to their different expression patterns and not necessarily to differences in their polarization with respect to auxin concentration or flux as previously hypothesized (O'Connor et al., 2014). In order to assess the functional differences between the proteins independent of transcriptional context, we expressed both Brachypodium proteins tagged with Citrine (a YFP derivative) in wild-type Arabidopsis (Columbia, Col-0) under the control of a 3.5 kb Arabidopsis PIN1 promoter fragment which includes sequences known to drive PIN1 expression sufficient to complement pin1 mutants (proAtPIN1) (Benková et al., 2003; Heisler et al., 2005). In the Arabidopsis inflorescence meristem, wild-type AtPIN1 forms convergent polarization patterns that mark the sites of initiating flower primordia (Figure 3A). Remarkably, despite the loss of the SoPIN1 clade from Arabidopsis, Brachypodium SoPIN1 also created clear convergent polarization patterns in Arabidopsis inflorescence meristems but was less abundant in the central domain of the apical dome (Figures 3B, 25 of 27 meristems from 4 independent transgenic events). Similar to AtPIN1, SoPIN1 protein abundance was highest in the meristem epidermis and SoPIN1 convergence points were most clearly observed surrounding I2 and I1 primordia (Figure 3B). Below the epidermis wild-type AtPIN1 accumulates in small groups of cells that will become the vasculature (Figure 3—figure supplement 1 panel A arrows). In contrast, sub-epidermal SoPIN1 accumulated in an ill-defined ring shape surrounding the meristem central domain without distinct foci of accumulation (Figure 3—figure supplement 1 panel B, 15 of 23 meristems from 4 independent transgenic events). AtPIN1, SoPIN1, and PIN1b show different behaviors when expressed in wild-type Arabidopsis. Arabidopsis AtPIN1 promoter (proAtPIN1) driven expression of GFP-tagged AtPIN1 and Citrine-tagged (a YFP derivative) SoPIN1 and PIN1b in wild-type Columbia (Col-0) Arabidopsis. (A,D,G,J) AtPIN1, (B,E,H,K) SoPIN1, (C,F,I,L) PIN1b. (A–C) Maximum projections of inflorescence meristem apexes. Arrows in (A) and (B) indicate convergence points (cp) in I2 primordium. Arrowhead in (C) indicates internalized PIN1b in punctate membrane bodies. The I2 and I1 primordia are labeled. (D–F) Tiled confocal maximum projections of longitudinal hand-sections through inflorescence apexes. Arrows indicate SoPIN1 epidermal accumulation in sepal primordia and flower pedicels in (E) and the lack of AtPIN1 and PIN1b epidermal accumulation in the same tissues in (D) and (F). Box in (D) shows detail area in Figure 3—figure supplement 1 panel D. (G–I) Tiled confocal maximum projections of longitudinal hand-sections through mature basal inflorescence stem internodes 1 cm above the rosette. (J–L) Tiled confocal maximum projections of hand cross-sections through basal internodes 1 cm above the rosette. Signal at the edge of each section (arrowheads) is cuticle auto-fluorescence. The cortex (co), cambium (ca), xylem parenchyma (xp), and pith (p) tissues are indicated in (G–L). Arrows in (H) and (K) indicate cortex and pith ectopic accumulation of SoPIN1. Red signal in all panels is chlorophyll auto-florescence. Scale bars: 25 µm in (A–C), and 100 µm in (D–L). In contrast to both AtPIN1 and SoPIN1, under the same promoter significant PIN1b accumulation was absent from the meristem epidermis in 19 of 29 meristems from 7 independent transgenic events. In the meristems where PIN1b accumulated in the epidermis it did not show clear convergent polarization patterns and its polarity was often unclear (Figures 3C, 10 meristems from 2 events). Within initiating organs PIN1b often localized to punctate vesicular bodies inside cells, not in the cell membrane (Figure 3C arrowhead). PIN1b accumulation remained low just below the meristem apex, but in contrast to SoPIN1, PIN1b formed defined domains around the presumptive developing vascular bundles similar to AtPIN1 (Figure 3—figure supplement 1 panel C arrows). The lack of PIN1b protein in the meristem epidermis was not due to silencing of the transgene in these lines because we observed abundant PIN1b protein in the developing vasculature below the apex, even in plants where the meristem had no detectable epidermal expression (Figure 3F) (8 samples from 4 events). In contrast, AtPIN1 and SoPIN1 accumulated in both the vasculature and the epidermis in these more mature tissues (Figure 3D and E) although SoPIN1 seemed more abundant in the epidermis than AtPIN1 (see arrows) (SoPIN1 - 5 samples from 2 events). In order to determine whether there were similar tissue-level differences in protein accumulation in mature tissues where AtPIN1 is implicated in branch control, we imaged AtPIN1, SoPIN1 and PIN1b in the basal internode in mature plants 1 cm above the rosette. Here AtPIN1 normally accumulates in a highly polar manner in the rootward plasma membranes of cambium (ca) and xylem parenchyma (xp) vascular-associated tissues (Figure 3G and J) (Bennett et al., 2016; Gälweiler et al., 1998). PIN1b accumulated in a similar pattern to AtPIN1 (Figure 3I and L. 10 samples from 5 events). In contrast, in addition to accumulating in the cambium and xylem parenchyma, SoPIN1 accumulated in the mature cortex (co) and central pith tissues (p) (Figure 3H and K. 15 samples from 4 events). AtPIN1 is not normally observed in the mature cortex or pith tissues (Figure 3G and J) (Bennett et al., 2016; Gälweiler et al., 1998). However we detected abundant AtPIN1 expression in the immature pith closer to the apex (Figure 3D box, Figure 3—figure supplement 1 panel D) suggesting that proAtPIN1 initially drives expression in a broad domain and that AtPIN1 and PIN1b are both cleared from the cortex and pith by maturity, while SoPIN1 is not. In the basal internode all three proteins showed the characteristic rootward polarization pattern regardless of tissue-level abundance (Figure 3—figure supplement 1 panels D, E, F arrows). Taken together these results show that even under the same transcriptional control AtPIN1, SoPIN1 and PIN1b show distinct tissue-level accumulation patterns in Arabidopsis. While the overall behavior of the two Brachypodium proteins is similar to AtPIN1 in many tissues, there are behaviors unique to each. 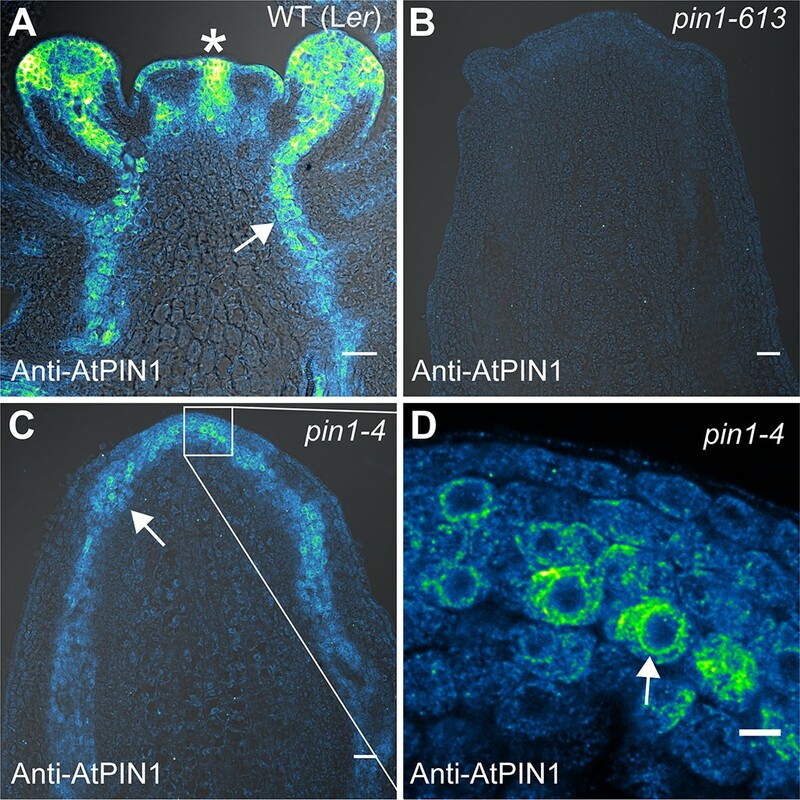 PIN1b fails to accumulate in epidermal tissues where AtPIN1 and SoPIN1 remain high, whereas SoPIN1 accumulates in the mature cortex and pith tissue where AtPIN1 and PIN1b do not. The convergent polarization patterns of SoPIN1 and the vascular accumulation of PIN1b in Arabidopsis are remarkably similar to their native behaviors in Brachypodium (O'Connor et al., 2014) suggesting protein-intrinsic features might control tissue-level accumulation in the two species. To determine whether the observed differences in SoPIN1 and PIN1b polarization and accumulation have functional consequences in Arabidopsis, we used the proAtPIN1-driven SoPIN1 and PIN1b constructs to complement the Arabidopsis pin1-613 mutant (also known as pin1-7). The pin1-613 allele is a putative null T-DNA insertion allele with severe organ initiation defects in the inflorescence (Zourelidou et al., 2014; Bennett et al., 2006; Smith et al., 2006). Given that epidermal AtPIN1 function is important for organ initiation (Bilsborough et al., 2011; Kierzkowski et al., 2013), as expected only SoPIN1 and not PIN1b was able to complement the pin1-613 mutation and mediate organ initiation (Figure 4A). 3 out of 6 independent SoPIN1-expressing transgenic events showed complementation whereas all 10 independent PIN1b-expressing transgenic events failed to complement. However phenotypic complementation of pin1-613 by SoPIN1 was incomplete with mature plants showing a variety of phenotypic defects (Figure 4A, Figure 4—figure supplement 1). Most notably each flower produced more sepals and petals than wild-type but almost no stamens (Figure 4C, Figure 4—figure supplement 2). SoPIN1-complemented pin1-613 plants were thus sterile. We wondered whether these phenotypes could be explained by poor auxin transport function of SoPIN1 in Arabidopsis. However SoPIN1 restored wild-type levels of bulk auxin transport to pin1-613 basal internodes (Figure 4D). Thus SoPIN1 is capable of supporting organ initiation and mediating rootward auxin transport in the stem, but it is not functionally identical to AtPIN1 expressed under the same promoter. 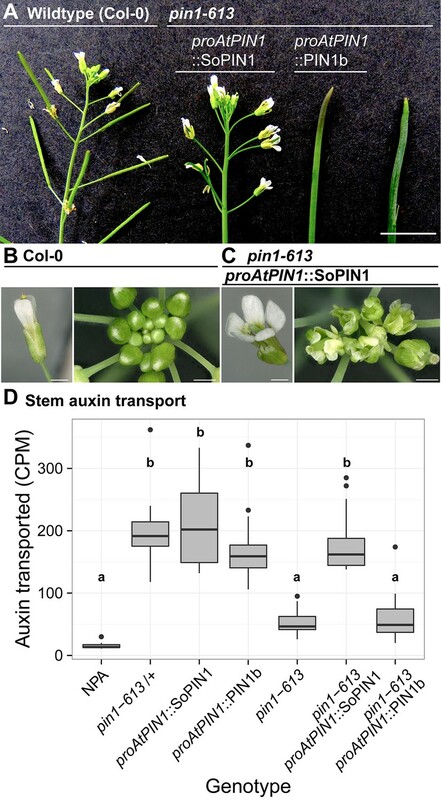 SoPIN1 but not PIN1b can partially complement the Arabidopsis pin1-613 mutant organ initiation and bulk transport defects. (A) From left to right, inflorescence phenotypes of WT (Col-0), proAtPIN1::SoPIN1 in pin1-613, proAtPIN1::PIN1b in pin1-613, and pin1-613 alone. Note that PIN1b-expressing pin1-613 plants are indistinguishable from pin1-613 alone. See Figure 4—figure supplement 1 for whole-plant phenotypes. (B) Flower (left), and inflorescence apex (right) of WT (Col-0). (C) Flower (left), and inflorescence apex (right) of proAtPIN1::SoPIN1 complemented pin1-613 mutants. Note the increase in petal number and lack of stamens in the flower, see Figure 4—figure supplement 2 for organ counts. (D) Box-plot of bulk auxin transport (counts per minute, CPM) through basal internodes 1 cm above the rosette of 40-day-old Arabidopsis inflorescence stems. (n = 16 each genotype). Samples with different letters are significantly different from each other (ANOVA, Tukey HSD, p<0.05). See Figure 4—source data 1 for source data. Scale bars: 1 cm in (A), 1 mm in (B–C). In SoPIN1-complemented pin1-613 mutants, SoPIN1 protein accumulation in the meristem epidermis was higher than that observed in a wild-type or heterozygous genetic background and the pronounced convergent polarization patterns observed in the wild-type background were less defined (Figure 5A, Figure 5—figure supplement 1) (16 of 16 meristems). SoPIN1-complemented meristems showed a variety of phyllotactic defects and had highly variable morphologies (Figure 5—figure supplement 1 panel B) (16 of 16 meristems). Similar to the pattern observed in the wild-type background, sub-epidermal SoPIN1 in pin1-613 mutants accumulated in a loosely defined ring within which individual vein traces were difficult to discern (Figure 5I) (13 of 16 meristems). In mature tissues SoPIN1 accumulated in the epidermis, vasculature and pith, similar to the wild-type background (Figure 5C, E and G). SoPIN1 and PIN1b localization in null pin1-613 mutants. Arabidopsis PIN1 promoter (proAtPIN1) driven expression of Citrine-tagged (YFP derivative) SoPIN1 and PIN1b in null pin1-613 mutant tissue. (A,C,E,G,I) SoPIN1, (B,D,F,H,J,K,L,M) PIN1b. (A–B) Maximum projections of inflorescence meristem apexes. Arrow in (B) indicates PIN1b ring shaped epidermal domain. See Figure 5—figure supplement 1 for SoPIN1 expression in a pin1-613 segregating family. See Figure 5—figure supplement 2 for more examples of PIN1b expression in pin1-613 apexes. 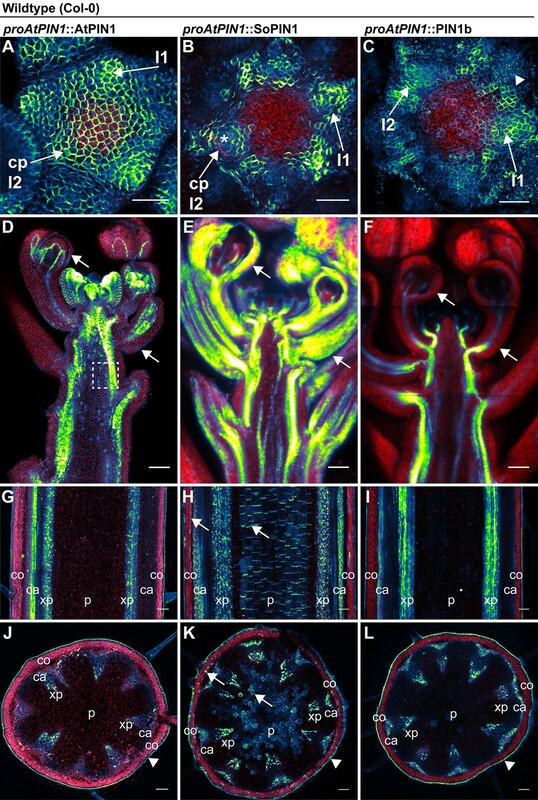 (C–D) Tiled confocal maximum projections of longitudinal hand-sections through inflorescence apexes. Arrow in (D) indicates increased PIN1b in the epidermis in the pin1-613 background. (E–F) Tiled maximum projections of longitudinal hand-sections through mature basal inflorescence stem internodes 1 cm above the rosette. (G–H) Tiled maximum projections of hand cross-sections through mature basal internodes 1 cm above the rosette. Signal at the edge of each section (arrowheads) is cuticle auto-florescence. The cortex (co), cambium (ca), xylem parenchyma (xp), and pith (p) tissues are indicated in (E–H). Arrows in (E) and (G) indicate cortex and pith accumulation of SoPIN1. (I) Confocal z-section of SoPIN1 accumulation in a ring-shaped domain just below the apex of a complemented pin1-613 meristem. (J) Longitudinal hand-section of PIN1b just below a pin1-613 meristem apex. Arrow shows rootward polarized PIN1b. (K) Detail of polarized PIN1b in the meristem epidermis of a pin1-613 meristem apex. (L) Cross-section of PIN1b (arrow) in distinct bundles 2 mm below a pin1-613 meristem apex. (M) Rootward polarization of PIN1b (arrow) 3–4 mm below the apex of a pin1-613 meristem. Red signal in all panels is chlorophyll auto-florescence. Scale bars: 25 µm in (A–B), 100 µm in (C–H), and 25 µm in (I–M). In contrast to SoPIN1, PIN1b-expressing pin1-613 plants had pin-formed inflorescences that were indistinguishable from pin1-613 alone (Figure 4A) (all 10 expressing events failed to complement). The lack of complementation mediated by PIN1b was not caused by silencing or low expression level because abundant PIN1b signal was observed in pin1-613 meristems (23 of 26 pin1-613 meristems from 7 events). In contrast to the wild-type background, most PIN1b expressing pin1-613 samples had abundant epidermal expression forming a ring-shaped domain around the meristem apex (Figure 5B and D arrow, Figure 5—figure supplement 2) (14 of 19 meristems from 6 events). Also unlike the wild-type background, PIN1b in the epidermis of pin1-613 meristems was more consistently targeted to the membrane and was often polar (Figure 5K). However even with this elevated polar expression in the meristem epidermis, PIN1b was unable to mediate organ initiation in pin1-613 mutants. Below the apex PIN1b was polarized rootward in pin1-613 meristems (Figure 5J), forming defined traces associated with the vasculature (Figure 5F and L). In the basal stem of pin1-613 mutants PIN1b accumulated in a pattern similar to wild-type, although the arrangement of vascular bundles was irregular (Figure 5H). Remarkably, despite clear polar PIN1b expression in pin1-613 mutant stems (Figure 5M), PIN1b was unable to rescue bulk auxin transport in this tissue (Figure 4D). Because PIN1b seemed to form more defined sub-epidermal traces than SoPIN1 (Compare Figure 3—figure supplement 1 panels B and C, and Figure 5I and L) we thought PIN1b combined with SoPIN1 may improve the partial SoPIN1-mediated complementation of pin1-613. We tested two independent PIN1b events for complementation of pin1-613 when combined with a SoPIN1 event that showed partial complementation, but all double SoPIN1/PIN1b expressing pin1-613 plants appeared phenotypically similar to the SoPIN1-only complementation (data not shown). Thus SoPIN1 combined with PIN1b is no better than SoPIN1 alone. In total these results demonstrate that when expressed in Arabidopsis, there is a clear functional separation between SoPIN1 and PIN1b independent of transcriptional control. Epidermal-specific AtPIN1 expression is sufficient to rescue organ initiation in atpin1 mutants (Bilsborough et al., 2011), highlighting the importance of AtPIN1 epidermal expression to organ initiation. We wanted to test specifically the ability of SoPIN1 and PIN1b to perform this epidermal function. In order to drive increased PIN1b expression in the epidermis and to help reduce transgene position-effect variation of expression level, we utilized a two-component expression system in the Landsberg erecta (Ler) background to drive SoPIN1 and PIN1b under the control of the epidermis-enriched Arabidopsis ML1 promoter (Hereafter designated proAtML1>>) (Lenhard and Laux, 2003; Sessions et al., 1999). Under the control of proAtML1 we achieved consistently high epidermal accumulation of both SoPIN1 and PIN1b, but similar to the proAtPIN1 driven expression described above, only SoPIN1 showed clear convergent polarization patterns around the sites of organ initiation (Figure 6A–6D, Figure 6—figure supplements 1 and 2) (11 of 11 meristems from 2 events). Despite consistently high epidermal expression with this system, PIN1b polarity remained difficult to determine and in many cells the abundance of protein on the membrane remained low (Figure 6D) (13 of 13 meristems from 2 events). Instead PIN1b accumulated in intracellular bodies, especially in the cells of the apical dome and the central domain of initiating organs (Figure 6—figure supplement 3 panels A-D). Intracellular PIN1b did not co-localize with early endosomes as assayed by FM4-64 (Figure 6—figure supplement 3 panel C arrows), or show the perinuclear localization characteristic of the endoplasmic reticulum, suggesting accumulation in either the golgi apparatus or in vacuoles. PIN1b abundance and polarity was highest at the boundaries of lateral organs (Figure 6—figure supplement 2). Thus SoPIN1 and PIN1b show consistent behaviors in the meristem epidermis when expressed under either proAtPIN1 or proAtML1. Despite increased PIN1b expression under proAtML1 and a resulting increase in protein accumulation in the apex, PIN1b was still unable to form convergent polarization patterns in wild-type plants. SoPIN1 and PIN1b show different behaviors under proAtML1-driven expression. Maximum projections of proAtML1::LhG4 driving pOP::SoPIN1 or pOP::PIN1b (proAtML1 >>SoPIN1 and proAtML1 >>PIN1b) in wild-type Landsberg erecta (Ler) (A–D), and pin1-4 (E–L) inflorescence meristems and mature basal internodes. (A) SoPIN1 and (B) PIN1b maximum projections of wild-type Ler inflorescence meristems. I3, I2, I1, and P1 primordia are indicated. White boxes around each I2 primordium indicate the regions detailed in (C–D). Asterisk in (C) indicates convergence point. Arrow in (D) indicates punctate PIN1b. (E) SoPIN1 and (F) PIN1b maximum projections of complemented pin1-4 inflorescence meristems. I3, I2, I1, and P1 primordia are indicated. White boxes around each I2 primordia indicate the regions detailed in (G–H). Asterisks mark convergence points in (G) and (H). Red signal in (C,D,G,H) is cell wall propidium iodide staining. See Figure 6—figure supplement 1 for additional samples of proAtML1 >>SoPIN1 and Figure 6—figure supplement 2 for additional samples of proAtML1 >>PIN1b in both WT and pin1-4 meristems. See Figure 6—figure supplement 3 for details of PIN1b epidermal intracellular localization in WT and pin1-4 meristem apexes. (I–J) Tiled maximum projections of cross hand-sections of mature basal internodes of SoPIN1 (I) and PIN1b (J) -complemented pin1-4 plants showing PIN signal in the outer cortex layers (arrows). The cortex (co), cambium (ca), xylem parenchyma (xp), and pith (p) tissues are indicated. Red signal in (I–J) is chlorophyll auto-florescence. (K–L) Epidermal maximum projections showing rootward polarized PIN localization (arrows) in the basal internode of SoPIN1 (K), and PIN1b (L) -complemented pin1-4 plants. Scale bars: 25 µm in (A–H). 100 µm in (I–L). In order to determine whether the increased PIN1b abundance in the epidermis achieved by the proAtML1 two-component system had functional consequences, we crossed these transgenes to the pin1-4 mutant allele. The pin1-4 allele is in the Landsberg erecta (Ler) background and has a single P579 to L amino acid change in the second-to-last transmembrane domain of AtPIN1 (Bennett et al., 1995), but the phenotype is similarly severe to the null pin1-613 allele (Figure 7A–C). However using immuno-localization we detected abundant AtPIN1 protein produced in pin1-4 meristems (Figure 7C), while similar to previous authors we did not detect any protein in pin meristems of the null pin1-613 allele (Figure 7B) (Zourelidou et al., 2014; Bennett et al., 2006) (6 pin1-613 meristems, 5 pin1-4 meristems). The AtPIN1 protein detected in pin1-4 mutants accumulated primarily in the provascular tissues below the pin apex (Figure 7C) and appeared apolar (Figure 7D). Instead the perinuclear AtPIN1 localization in pin1-4 suggests accumulation in the endoplasmic reticulum (Figure 7D, arrow). The presence of AtPIN1 protein produced in pin1-4 mutants indicates that AtPIN1 in this background may retain partial function despite the severity of the mutant phenotype. AtPIN1 protein immuno-localization in wild-type, pin1-613, and pin1-4 meristems. (A) AtPIN1 protein accumulation in wild-type Ler inflorescence apex shows polar PIN protein at the sites of initiating organs (asterisk), and during vein patterning below the apex (arrow). (B) No AtPIN1 protein is detected in pin1-613 null mutant pin-formed apexes. (C) Abundant AtPIN1 protein is detected in pin1-4 pin-formed apexes, primarily in provascular tissues below the meristem apex (arrow). Box shows region of detail in (D). (D) Detail of boxed area shown in (C). AtPIN1 protein in pin1-4 accumulates in a perinuclear domain (arrow). All samples are 9 µm longitudinal sections. Scale bars: 25 µm in A-C, and 5 µm in D.
Indeed both SoPIN1 and PIN1b driven by proAtML1 were able to rescue the organ formation defects of pin1-4 (Figure 8A). In contrast to the partial SoPIN1-mediated complementation and failure of PIN1b to complement pin1-613 described above, both SoPIN1 and PIN1b-complemented pin1-4 plants made WT flowers that produced seed (Figure 8—figure supplement 1). In addition SoPIN1 and PIN1b were both able to rescue bulk auxin transport in the pin1-4 basal internode, although PIN1b was less effective than SoPIN1 (Figure 8B). In general SoPIN1 and PIN1b-mediated complementation of pin1-4 was phenotypically similar, but perhaps as a result of the decreased transport rate in PIN1b-complemented pin1-4 plants, this genotype showed a significant increase in stem diameter (Figure 8C), providing further evidence that SoPIN1 and PIN1b are not functionally equal. Both SoPIN1 and PIN1b can complement Arabidopsis pin1-4 under proAtML1-driven expression. (A) From left to right, wild-type Ler, proAtML1 >>PIN1b complemented pin1-4, proAtML1 >>SoPIN1 complemented pin1-4, and pin1-4 alone. Arrow indicates barren pin inflorescence in pin1-4. See Figure 8—figure supplement 1 for inflorescence phenotypes. (B) Box-plot of bulk auxin transport (counts per minute, CPM) through basal internodes 1 cm above the rosette of 40-day-old Arabidopsis inflorescence stems (n = 16 each genotype). Samples with different letters are significantly different from each other (ANOVA, Tukey HSD, p<0.05). See Figure 8—source data 1 for source data. (C) Box-plot of stem cross-sectional area (square mm) of the mature basal internode 1 cm above the rosette (n = 12 each genotype). Samples with different letters are significantly different from each other. (ANOVA, Tukey HSD, p<0.05). See Figure 8—source data 2 for source data. Representative Toluidine Blue O stained hand cross-sections are shown above each box for each genotype. Scale bars: 1 cm in (A). 500 µm in (C). SoPIN1-complemented pin1-4 meristems were slightly smaller than wild-type (Figure 6—figure supplement 1), but the protein localization was similar to the pattern observed in the WT background, with clear convergent polarization around initiating organs (Figure 6E and G) (10 of 10 meristems from 1 event). In contrast, compared to the WT background, PIN1b localization in pin1-4 was dramatically altered (compare Figure 6B with Figure 6F). Most obvious was an increase in membrane targeted PIN1b and a corresponding reduction in intracellular PIN1b (Figure 6H, Figure 6—figure supplement 3 panels E-H). PIN1b polarization in the pin1-4 background was more apparent than in wild-type, and convergent polarization patterns clearly marked incipient organs (Figure 6H) (10 of 10 meristems from 1 event). PIN1b-complemented meristems accumulated less PIN protein in the apical dome compared to SoPIN1-complemented meristems, and the meristems were larger (Figure 6—figure supplement 2). In the basal internode, both PINs had similar accumulation patterns in the cortex (co) and epidermis layers (Figure 6I–J arrows) and both showed rootward polarization in the epidermis (Figure 6K–L arrows). Despite this expression domain being drastically different than the wild-type vascular-associated pattern of AtPIN1 (Bennett et al., 2006; Gälweiler et al., 1998), expression in these few cortex layers and epidermis was apparently sufficient to drive near wild-type levels of rootward bulk auxin transport in pin1-4 (Figure 8B). Thus while both proteins can complement the pin1-4 organ initiation phenotype, the SoPIN1 and PIN1b complemented lines have differing localization patterns, slightly different auxin transport properties and minor differences in meristem and mature plant morphologies, suggesting once again that SoPIN1 and PIN1b are not functionally identical. During spikelet development in Brachypodium, SoPIN1 forms convergent polarization patterns surrounding the sites of organ initiation and strong expression of the auxin response reporter DR5 (O'Connor et al., 2014). We provide additional evidence here that SoPIN1 polarizes towards sites of high auxin concentration by showing that a DII minimum occurs at SoPIN1 convergence points. In sopin1 mutants the reduction of DII does not occur, suggesting that SoPIN1 functions to concentrate auxin at epidermal maxima, and similar to Arabidopsis, this is required for organ initiation in the inflorescence. The barren inflorescence phenotype of sopin1-1 mutants and the specificity of SoPIN1 for the outer tissues and for convergent polarization patterns in Brachypodium provides further support for the idea that auxin maximum formation is necessary for organ initiation and that this is primarily mediated by convergent PIN in the meristem epidermis (Bhatia et al., 2016; Jönsson et al., 2006; Kierzkowski et al., 2013; Smith et al., 2006). SoPIN1 clade mutants have been reported in the legume Medicago truncatula and in tomato (Solanum lycopersicum) and these mutants show pleiotropic phenotypes involving phyllotaxy, organ initiation, inflorescence branching, leaf serrations and leaf compounding, but they do not form barren pin meristems (Martinez et al., 2016; Zhou et al., 2011). These wider morphogenetic events also involve epidermal PIN convergence points and associated auxin maxima (Barkoulas et al., 2008; Bilsborough et al., 2011), suggesting a general role for SoPIN1 clade members in generating such maxima. The lack of barren pin-formed meristems in these mutants suggests that different species are variably dependent on SoPIN1-generated auxin maxima for organ initiation. 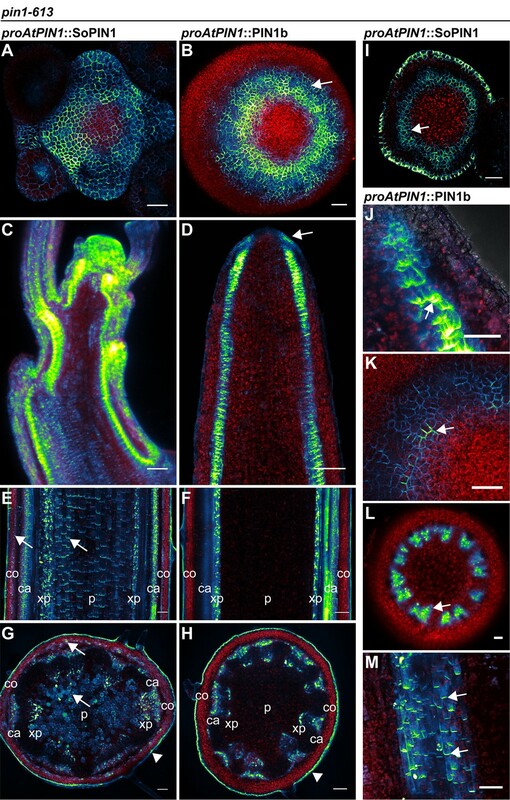 Even in Brachypodium and Arabidopsis, barren meristems in sopin1 and atpin1 respectively are restricted to later stages of development, so organs are able to form in the absence of SoPIN1 or AtPIN1 function. In contrast to sopin1 mutants, loss of pin1 clade function in Brachypodium has very little effect on organ initiation despite both PIN1a and PIN1b being expressed and polarized away from auxin maxima in developing organs (O'Connor et al., 2014). Auxin drainage is thought necessary for proper organ size and placement (Bhatia et al., 2016; Deb et al., 2015) but the most evident phenotype in pin1a/pin1b mutants is the alteration of internode length. The increased internode length in pin1b and severely reduced internode length in pin1a/pin1b double mutants provides new genetic tractability to address how PINs regulate tissue growth in the shoot independent of organ initiation, a PIN function that is experimentally inaccessible in Arabidopsis because of the initiation defects of atpin1 mutants. Grasses contain intercalary meristems, bands of indeterminate tissue separated from the apical meristem that are responsible for internode growth after organ initiation. Auxin dynamics in this more basal meristematic tissue may be important for controlling stem growth. Indeed loss of the ABCB1 auxin exporter in maize and Sorghum results in dwarfism associated with reduced activity of intercalary meristems (Knöller et al., 2010; Multani et al., 2003). The role of PIN1a and PIN1b in regulating intercalary meristem growth will be an important avenue for future work, especially since plant stature has played such an important role in grass domestication. We used heterologous expression of SoPIN1 and PIN1b in Arabidopsis to explore the ways in which different PIN family members may have different properties post-transcription (Summarized in Figure 9). When expressed in the meristem epidermis in wild-type Arabidopsis, SoPIN1 is localized to the membrane in most cells while PIN1b often accumulates internally (Figure 6—figure supplement 3). Thus with the same transcriptional control, different PINs can vary in the degree to which, after protein production, they accumulate at the plasma membrane. The differential membrane targeting of PIN1b and SoPIN1 is a tissue-specific phenomenon however, because unlike in the epidermis, in the basal internode both PINs accumulate at the rootward plasma membrane (Figure 3—figure supplement 1 panels E and F). The regulation of PIN plasma membrane polar targeting and endocytic recycling has been an important avenue for understanding PIN function and general membrane protein biology (Luschnig and Vert, 2014). Our results provide further evidence that at least some of the signals governing membrane accumulation are inherent in, and vary between, different PIN family members (Wisniewska et al., 2006). Heterologous expression visual summary: Functional distinction between PIN auxin efflux proteins during development. Polarized SoPIN1 is represented by green lines, polarized PIN1b by blue lines, un-polarized PIN1b by blue ovals, and the putative partially functional pin1-4 protein is indicated by magenta circles. Red arrows indicate measured auxin transport in the mature basal internode, while red bar-headed lines indicated reduced transport. Black arrows represent polarized PIN patterns. Convergence points are marked with asterisks. (A) When expressed in both the epidermis and internal tissues with proAtPIN1 in wild-type Col-0, SoPIN1 forms convergent polarization patterns in the epidermis and is partially able to rescue the organ initiation phenotypes and bulk transport in null pin1-613 mutants. (B) When SoPIN1 is expressed in the epidermis from the proAtML1 promoter, it forms convergence points in the wild-type Ler background and is able to rescue more fully the organ initiation phenotypes of the pin1-4 single amino acid change mutation. (C) In contrast, when PIN1b is expressed in both the epidermis and internal tissues from the proAtPIN1 promoter in wild-type Col-0, it accumulates mostly in the internal tissues, and is unable to complement the pin1-613 organ initiation phenotype. It is also unable to transport auxin through mature stem segments, despite apparently AtPIN1-like accumulation and polarization in the stem. (D) When PIN1b is expressed in the epidermis from the proAtML1 promoter it does not form convergent polarization patterns and is often un-polarized in the wild-type Ler background (blue ovals), but it does in the pin1-4 background, where it is able to rescue the defective organ initiation phenotype and mediate bulk transport. See Figure 9—figure supplement 1 for a protein alignment comparing AtPIN1 to other PIN1-clade protein sequences from diverse angiosperms. Under the same transcriptional control AtPIN1, SoPIN1 and PIN1b show different tissue-level accumulation patterns in Arabidopsis. In wild-type plants, proAtPIN1-expressed PIN1b shows reduced overall accumulation in the epidermis compared to AtPIN1 or SoPIN1 (Compare Figure 3D–3F). Even with greater expression under proAtML1, the intracellular PIN1b signal observed in the meristem epidermis (Figure 6—figure supplement 3) suggests that PIN1b protein could be actively targeted to the vacuole for degradation as has been shown for PIN2 in the root (Abas et al., 2006; Kleine-Vehn et al., 2008b). In contrast, SoPIN1 is abundant in the meristem epidermis and accumulates in the mature cortex and pith tissues where AtPIN1 and PIN1b do not (Figure 3H arrows). 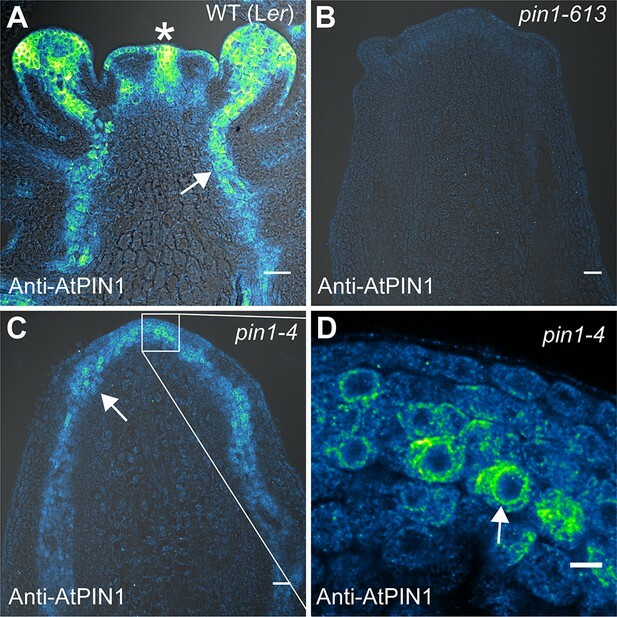 Because we observed clear AtPIN1 accumulation in the immature pith (Figure 3—figure supplement 1 panel D), this suggests that proAtPIN1 is at least initially active in pith tissue and that the PIN1 clade members AtPIN1 and PIN1b are removed later in development, while SoPIN1 is not. Laser capture micro-dissection and RNAseq of mature stem tissue has detected abundant AtPIN1 transcription in the mature pith (T. Greb, personal communication, February 2017) suggesting that even at maturity AtPIN1, and probably PIN1b, are actively cleared post-transcriptionally from this tissue. Our results suggest that the AtPIN1 expression domain is far broader than is indicated by the protein accumulation pattern and further highlight the importance of PIN post-transcriptional regulation for controlling PIN tissue-level abundance. In Arabidopsis endogenous PIN family members show a degree of cross-regulation where loss-of-function mutations in one PIN family member result in tissue-level accumulation of a different PIN in a compensatory pattern (Blilou et al., 2005; Paponov et al., 2005; Vieten et al., 2005). We observed similar behavior in the pin1-613 null background where SoPIN1 and PIN1b accumulation in the meristem epidermis was increased in the absence of AtPIN1 (Figure 5—figure supplements 1 and 2). This sensitivity of SoPIN1 and PIN1b to the presence of AtPIN1, even while under the AtPIN1 promoter, suggests that wild-type AtPIN1 is able to compete with SoPIN1 and PIN1b post-transcriptionally for residency at the membrane. However we did not observe the same competitive effect with proAtML1 where SoPIN1 and PIN1b tissue-level accumulation, though not membrane residence, seemed similar between pin1-4 mutant and wild-type meristems (Figure 6—figure supplements 1 and 2). This difference between proAtPIN1 and proAtML1 may be because PIN transcription under proAtPIN1 is sensitive to the dosage of other PINs as has been suggested (Vieten et al., 2005). Alternatively, the lack of increased SoPIN1 and PIN1b accumulation in the pin1-4 mutant background may be because the AtPIN1 protein produced in pin1-4 is still able to compete with the other expressed PINs. Regardless, these results highlight the sensitivity of PIN tissue-level abundance to both transcriptional and post-transcriptional control, and the variability between PIN family members independent of transcription. In Arabidopsis phosphorylation of PINs by several different families of protein kinases is thought necessary for efficient auxin transport (Zourelidou et al., 2014; Barbosa et al., 2014; Jia et al., 2016; Willige et al., 2013). PIN activation by phosphorylation may explain the inability of PIN1b to mediate bulk auxin transport in the basal internode of pin1-613 plants despite being expressed, accumulating at the membrane and being polarized rootward in this tissue (Figure 4D, Figure 5M). It is possible that in the proAtPIN1 domain PIN1b does not interact with the appropriate activating kinase and it is thus unphosphorylated and inactive. Indeed a partially unphosphorylatable form of AtPIN1 fails to complement fully the bulk auxin transport defect of pin1-613 mutants in the basal internode (Zourelidou et al., 2014) and AtPIN1 polarity can be uncoupled from phosphorylation status, and thus presumably transport activity can be independent of polarization (Weller et al., 2017). However, when expressed using proAtML1, PIN1b expression in the outer tissue layers of the basal internode appears sufficient to mediate bulk auxin transport in pin1-4 (Figure 8B). One explanation for this is that PIN1b activity may be tissue dependent, perhaps because of the differing expression domains of activating kinases (Zourelidou et al., 2014). Arabidopsis PIN4 and PIN7 are present in the proAtML1 domain (Bennett et al., 2016) making it conceivable that these PINs are the normal targets of activating kinases in this tissue. Alternatively, kinases in the Ler genetic background may be more effective at activating PIN1b than those in Col, but the dramatic effect of the pin1-4 allele vs wild-type AtPIN1 on PIN1b polarization behavior within the Ler background makes this explanation unlikely (see below). In either case the behavior of PIN1b in pin1-613 provides a clear indication that even once a PIN has accumulated at the cell membrane in a tissue it may not be active. A particularly striking result is the ability of PIN1b to form convergent polarization patterns and mediate organ initiation in the pin1-4 missense mutant background when it is unable to do so in the null pin1-613 background. It is unlikely that differences between proAtPIN1 and proAtML1-mediated expression can explain this differential complementation because both promoters drive expression in the epidermis and both promoters are sufficient to complement atpin1 mutants using wild-type AtPIN1 as well as SoPIN1. As described above, it is possible that differences in activating enzymes or similar interactors between the Ler and Col backgrounds could contribute to the strikingly different behavior of PIN1b in pin1-4 vs pin1-613. Indeed mutation of the leucine-rich repeat receptor-like kinase ERECTA, which is mutated in the Ler background, has known effects on PIN1 localization when combined with other mutations in the ERECTA family (Chen et al., 2013; Torii et al., 1996). However the dramatic effect of wild-type AtPIN1 vs pin1-4 on PIN1b membrane targeting (compare Figure 6—figure supplement 3 panels A-D to E-H) within the Ler background suggests the differing genetic backgrounds of each complementation (Ler vs Col-0) is not sufficient to explain the differential complementation. Instead the strong influence of pin1-4 on PIN1b membrane targeting and polarity in the meristem epidermis suggests that PIN1b may be cooperating with a partially functional pin1-4 protein and together they recapitulate the organ initiation functions of wild-type AtPIN1. PIN1b interaction with pin1-4 in the outer cortex of the stem may also explain the ability of PIN1b to rescue bulk transport in the basal internodes of pin1-4 mutants while it cannot in the null pin1-613 allele. Partial pin1-4 function is further supported by the result that SoPIN1 complementation of the null pin1-613 allele is incomplete and because of flower defects the plants are sterile (Figure 4C), while SoPIN1-mediated complementation of pin1-4 is complete and flowers are phenotypically normal and set seed (Figure 8—figure supplement 1). Accordingly SoPIN1 convergent polarization patterns are more evident in the presence of pin1-4 than they are during complementation of the null pin1-613 allele (Compare 5A and 6E), further evidence that residual pin1-4 function augments SoPIN1 during pin1-4 complementation. Combined these data suggest that the pin1-4 allele is hypomorphic and that it provides some necessary function to PIN1b. If PIN1b is indeed inactive in null pin1-613 mutants as we hypothesized above then it is possible pin1-4 facilitates the interaction of PIN1b with the appropriate activating kinase and this allows PIN1b to perform organ initiation and bulk transport. Alternatively interaction between PIN1b and pin1-4 may facilitate proper membrane targeting or polarization of either protein, resulting in functional transport. The increased level of polar, plasma-membrane localized PIN1b in pin1-4 meristems supports the idea that pin1-4 controls PIN1b membrane residency, but it cannot explain why PIN1b appears unable to mediate bulk transport in pin1-613 despite being membrane-localized and polar in the basal internode. Direct PIN-PIN interactions have so far not been shown, but if one PIN type can convey targeting, polarity or activity information to another through direct or indirect interaction this may be relevant to auxin transport in tissues where multiple PINs are coexpressed, such as in the Arabidopsis root meristem (Blilou et al., 2005), or in the shoot apical meristems of most angiosperms where the SoPIN1 and PIN1 clade proteins likely overlap, as they do during spikelet development in Brachypodium (O'Connor et al., 2014). We previously showed that the polarization dynamics of SoPIN1, PIN1a and PIN1b in Brachypodium could be modeled by assigning two different polarization modes to the SoPIN1 and PIN1 clades (O'Connor et al., 2014). In the model, SoPIN1 orients toward the adjacent cell with the highest auxin concentration thus transporting auxin up the concentration gradient and providing a positive feedback to concentrate auxin into local maxima. In contrast, in the model PIN1a and PIN1b proteins are allocated in proportion to net auxin flux thus providing a positive feedback in which flux through the tissue is amplified by the allocation of PIN1a/b in the direction of that flux. The assignment of two different polarization modes was previously used to describe the behavior of AtPIN1 during organ placement and vein patterning using an auxin-concentration based switching mechanism between the up-the-gradient (UTG) and with-the-flux (WTF) polarization modes (Bayer et al., 2009). However it has also been suggested that a flux-based mechanism alone can account for both convergence points and vein patterning (Abley et al., 2016; Cieslak et al., 2015; Stoma et al., 2008). Despite evidence that convergent PIN polarization is dependent on localized auxin signaling in adjacent cells (Bhatia et al., 2016), there are still no proven mechanisms for direct sensing of intercellular auxin gradients or auxin fluxes across membranes. The sopin1, pin1a and pin1b phenotypes in Brachypodium are consistent with different polarization modes. SoPIN1 is required for organ initiation and the formation of auxin maxima in Brachypodium, which is primarily modeled using UTG polarization (Bayer et al., 2009; Jönsson et al., 2006; Smith et al., 2006). On the other hand, pin1a and pin1b mutant plants do not show organ initiation defects, but rather only have internode elongation defects, a tissue where WTF models have been used to explain PIN dynamics and measured auxin transport kinetics during vein patterning and the regulation of branch outgrowth (Bayer et al., 2009; Bennett et al., 2016; Mitchison, 1980, 1981; Prusinkiewicz et al., 2009). In wild-type Brachypodium, the SoPIN1 and PIN1a/b expression domains are almost entirely mutually exclusive (O'Connor et al., 2014), making it possible that the observed polarization differences between the two clades are due to expression context or tissue-level stability and not to functional differences between the proteins themselves. More specifically, perhaps an UTG mechanism dominates the epidermis while a WTF mechanism is utilized in the internal tissues and different PINs interact equally with these context-dependent mechanisms. Our heterologous expression studies do not exclusively support context-dependent or protein-dependent mechanisms for SoPIN1 and PIN1 polarization. It is clear that alone only SoPIN1 and AtPIN1 show the convergent polarization patterns associated with UTG polarization, and alone only SoPIN1 and AtPIN1 are thus able to mediate organ initiation, while PIN1b cannot. On the other hand, all three PINs are capable of rootward polarization in the basal internode tissue and PIN1b can be co-opted to convergent polarization at the meristem epidermis in the presence of pin1-4. The results presented here do not demonstrate whether within a single cell SoPIN1 and PIN1b would orient differently with respect to auxin as might be expected for the dual polarization model (O'Connor et al., 2014). However such context-independent polarization behavior was previously observed for PIN1 and PIN2 in the root where both PINs can polarize in opposing directions within a single cell type when expressed in the PIN2 domain (Kleine-Vehn et al., 2008a; Wisniewska et al., 2006). In total our Brachypodium mutant phenotypes and heterologous expression results point to multiple levels at which PIN family members can be functionally distinct. Differential membrane targeting, tissuelevel accumulation, transport activity, indirect or direct interaction and the resultant polarity may all contribute to the dynamics of PIN action during plant development. In most flowering plants two PIN clades, SoPIN1 and PIN1, with differing functions and differing transcriptional and post-transcriptional properties mediate auxin transport in the shoot, but these properties are seemingly combined into AtPIN1 in Arabidopsis and other Brassicaceae species. Because PIN1b alone is unable to mediate organ initiation while AtPIN1 can, and these two PINs are both members of the same clade, AtPIN1 may have gained the ability to form convergent polarization patterns and mediate organ initiation after or coincident with the loss of the SoPIN1 clade. Indeed when comparing Brassicaceae PIN1 proteins against a broad sampling of other angiosperm PIN1 proteins, the Brassicaceae PIN1 proteins have several divergent protein domains (Figure 9—figure supplement 1), suggesting possible neofunctionalization within the Brassicacea family. Alternatively an expansion of the PIN3,4,7 clade is also characteristic of Brassicaceae species (Bennett et al., 2014; O'Connor et al., 2014), making it possible duplicated members of this clade buffered the loss of SoPIN1. However there is no indication that PIN3,4,7 have a role in organ initiation in the inflorescence (Guenot et al., 2012). Regardless, we believe the combination of SoPIN1 and PIN1 characteristics into AtPIN1 coincident with the loss of the SoPIN1 clade represents a form of reverse-subfunctionalization, the combination of functions originally split between homologs into a single protein after gene loss. It is not surprising that PINs may be particularly amenable to this kind of functional evolution because, as described above, there are several post-transcriptional regulatory steps that ultimately combine to control PIN function in plants. The output of auxin transport is the sum of an extensive network of post-transcriptional interactions that all act to regulate auxin transport itself, and this gives the system plasticity during development and perhaps also over evolutionary time. SoPIN1 (Bradi4g26300), PIN1a (Bradi1g45020) and PIN1b (Bradi3g59520) were targeted with CRISPR using vectors developed for rice (Miao et al., 2013). CRISPR constructs were transformed into Brachypodium inbred line Bd21-3 using previously published methods (Bragg et al., 2015). The SoPIN1 guide was AGGCTGTCGTACGAGGAGT. This guide was shorter than the typical 20 bp in an effort to provide greater target specificity for SoPIN1 (Fu et al., 2014). In the T0 regenerated plants 5 out of 9 independent transgenic events showed severe organ initiation defects and all 5 contained lesions in the SoPIN1 CRIPSR target site. Unfortunately only one of the events with a T0 phenotype set seed. In the T1 progeny of this event only those individuals that contained the CRISPR transgene showed lesions in the SoPIN1 CRISPR target site and these plants showed the sopin1 phenotype and thus failed to set seed, suggesting active editing by the SoPIN1 CRISPR transgene in this event. Not all events showed such efficient editing however, and we identified an independent T1 family where a C insertion in the SoPIN1 CRISPR target site co-segregated with the barren inflorescence phenotype. We designated this allele, which causes a premature stop codon before the end of the third exon codon 739 base pairs downstream from the target site, sopin1-1. (Primer IDs 1–2 Table 1) We backcrossed a heterozygous sopin1-1 plant to the Bd21-3 parental line and all F1 progeny (N = 4) were wild-type. In the F2 generation, plants homozygous for the sopin1-1 lesion co-segregated with the barren inflorescence phenotype (N = 60: 32 het, 18 homo,10 wt). Amongst these plants, 16 did not have the Cas9 transgene (Primer IDs 3–4 Table 1) and the barren inflorescence phenotype still co-segregated with the sopin1-1 lesion (N = 16: 8 het, 3 homo, 5 wt). We crossed the T1 sopin1-1 heterozygous plant with a line homozygous for the previously published SoPIN1-Citrine genomic reporter line (O'Connor et al., 2014). In the F2 we identified two individuals homozygous for sopin1-1 but heterozygous for the SoPIN1-Citrine transgene. Only F3 progeny individuals that lacked the SoPIN1-Citrine transgene showed a sopin1-1 phenotype, while those that contained the SoPIN1-Citrine transgene made spikelets and set seed (N = 34: 6 sopin1-1 phenotype, 28 wt phenotype) (Figure 1—figure supplement 1). This complementation was independent of the presence of Cas9. The PIN1a guide was ATCTACTCCCGGCGGTCCAT. We identified edited plants in the T1 generation (Primer IDs 5–6 Table 1), then found a homozygous T insertion in the T2 generation which was independent of Cas9, resulting in a premature stop codon 939 base pairs downstream, here designated pin1a-1. No single-mutant pin1a-1 phenotypes were observed. The PIN1b guide was AGGGCAAGTACCAGATCC. We identified a single plant from the regenerating T0 PIN1b CRISPR population that had longer basal internodes and twisted leaves. This plant was homozygous for an A deletion in the PIN1b CRISPR target site causing a premature stop in the second exon 502 base pairs downstream, here designated pin1b-1 (Primer IDs 7–8 Table 1). All T1 progeny showed the pin1b phenotype and were homozygous for the pin1b-1 lesion. We backcrossed these T1 plants to Bd21-3 and all F1 progeny had a wild-type phenotype (N = 11). In the F2, the pin1b phenotype co-segregated with the pin1b-1 lesion (N = 215, 91 het, 39 homo, 26 wt). Amongst these plants, 24 did not have the Cas9 transgene and the pin1b phenotype still co-segregated perfectly with the pin1b-1 lesion (N = 24: 10 het, six homo, eight wt). We crossed pin1b-1 without Cas9 to a line homozygous for the previously published PIN1b-Citrine transgene (O'Connor et al., 2014). In the F3 we identified lines homozygous for both the transgene and pin1b-1 and used these to quantify internode lengths compared to pin1b-1 (Figure 2—figure supplement 1). Homozygous pin1b-1 lacking Cas9 was crossed to homozygous pin1a-1 lacking Cas9. In the F2 phenotypically pin1b-1 plants that were also genotyped heterozygous for pin1a-1 were identified. In the homozygous pin1b-1 F3 generation the double pin1a-1/pin1b-1 mutant phenotype segregated perfectly with the pin1a-1 lesion (N = 23: 10 het, five homo, eight wt). Double pin1a-1/pin1b-1 mutants were easily identified by phenotype and produce seed. 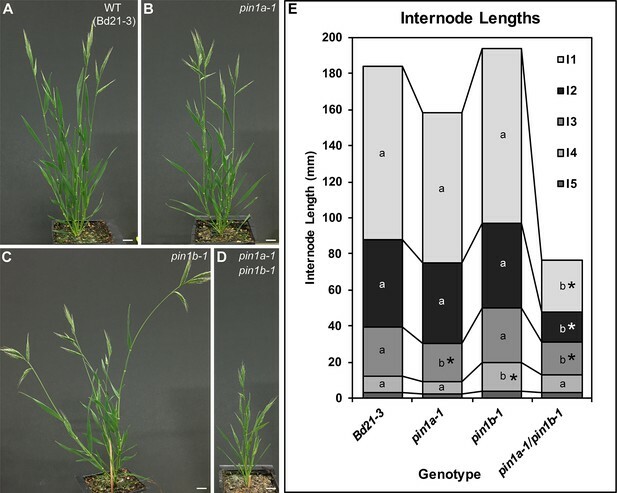 All constructs were cloned using Multi-site Gateway (Invitrogen Grand Island, NY) and were transformed into Brachypodium Bd21-3 using previously published methods (Bragg et al., 2015). For pZmUbi::DII-Venus, we first cloned the maize ubiquitin promoter into pDONR P4-P1R (Primer IDs 9–10 Table 1) and this was subsequently recombined with pDONR 221 containing Arabidopsis DII and pDONR P2R-P3 containing Venus-N7 (Brunoud et al., 2012) into the Multi-site Gateway binary vector pH7m34GW (http://gateway.psb.ugent.be/). In the T3 generation degradation of DII-Venus in the presence of auxin was validated by treating excised Brachypodium spikelet meristems with 1 µM 1-naphthaleneacetic acid (NAA) or mock treatment in 70% ethanol and imaging every 30 min (Figure 1—figure supplement 2). For SoPIN1-Cerulean, the promoter plus 5’ coding pDONR-P4-P1R and 3’ coding plus downstream pDONR-P2R-P3 fragments from (O'Connor et al., 2014) were used. Maize codon-optimized Cerulean fluorescent protein, courtesy of David Jackson, was amplified with 5x Ala linkers and cloned into pENTR/D-TOPO. These three fragments were then recombined into pH7m34GW. All constructs were cloned using Multi-site Gateway (Invitrogen) and transformed using standard floral dip. For proAtPIN1 complementation, a 3.5 kb Arabidopsis PIN1 promoter region was amplified from a genomic clone previously reported to complement the pin1 (Heisler et al., 2005) and cloned into Gateway vector pDONR P4-P1R (Primer IDs 11–12 Table 1). For each Brachypodium PIN-Citrine fusion construct, the entire PIN coding region, including the Citrine insertion, was amplified from the previously published reporter constructs (O'Connor et al., 2014) and cloned into pENTR/D TOPO (Primer IDs 13–16 Table 1). The Citrine fusion in each is located in a position known to complement pin1 mutations (Heisler et al., 2010; Wisniewska et al., 2006; Xu et al., 2006). The proAtPIN1 pDONR P4-P1R and PIN coding region pENTR/D-TOPO vectors were then recombined into Gateway binary vector pH7m24GW (http://gateway.psb.ugent.be/) and transformed by floral dip into both Col-0 and plants heterozygous for pin1-613 (also known as pin1-7, SALK_047613) (Bennett et al., 2006; Smith et al., 2006). Complementation was assessed in the T3 generation, and all plants were genotyped for both the pin1-613 mutation (Primer IDs 17–19 Table 1) and for presence of the PIN transgene (Primer IDs 20–22 Table 1). For the proAtML1 lines the PIN coding regions with Citrine insertion pENTR/D TOPO Gateway vectors were recombined downstream of the two-component OP promoter in vector pMoA34-OP (Moore et al., 1998) and then transformed into the proAtML1 driver line in the Landsberg erecta background (Lenhard and Laux, 2003). Lines homozygous for both the proAtML1 driver and OP::PIN were crossed to het pin1-4 and complementation was assessed in the F2 and F3 generations. All complemented plants were genotyped for pin1-4 (Primer IDs 23–24 Table 1), the Brachypodium PINs (Primer IDs 20–22 Table 1) and the presence of the ML1 driver transgene (Primer IDs 25–26 Table 1). All confocal images were captured on a Zeiss 780 laser scanning confocal using a W Plan-Apochromat 20x or 63x magnification 1.0 numerical aperture objectives (Zeiss, Jena, Germany). Detection wavelengths: 517–570 nm for Citrine-tagged PINs, 535–552 for DII-Venus, 463–509 for SoPIN1-CERULEAN, 490–543 for AtPIN1-GFP, 691–753 nm for FM4-64, 561–606 nm for Dylight 549, 631–717 nm for Propidium Iodide and 646–726 for chlorophyll A auto-fluorescence. The pinhole was set to one airy unit for all meristem stacks and details of sub-epidermal polarization but was open to the maximum setting for tiled longitudinal and cross sections of the basal internode (Figures 3D–L, 5C–H and and 6I–J). Detection gain and laser power were varied according to signal strength unless direct comparisons between genotypes were made as indicated in figure legends, except for Figure 1J and K where the DII gain was higher in Figure 1K in order to show DII distribution. Cryo scanning electron microscopy was performed on a Zeiss EVO HD15 SEM fitted with a LaB6 filament and a Quorum PP3010T (Quorum Technololgies, Lewes, Sussex. UK) cryo preparation unit using the BSD (Backscattered electron) detector with probe current as set to 10 nA, and 15.00 kV gun voltage. Frozen samples were coated in <1.5 nm Pt. Auxin transport assays were carried out as described in (Crawford et al., 2010). Briefly, 17 mm long basal internodes were excised and the apical end submerged in 30 μl Arabidopsis salts (ATS) without sucrose (pH = 5.6) containing 1 μM 14C-IAA (American Radiolabeled Chemicals, ST. Louis, M ). After 6 hr incubation the basal 5 mm segment was excised, cut in half, and shaken overnight at 400 RPM in 200 μl scintillation liquid prior to scintillation counting. 10 µM N-1-Naphthylphthalamic Acid (NPA), an auxin transport inhibitor, was added prior to incubation for negative controls. Detection of AtPIN1 in sectioned apexes was performed as previously described (O'Connor et al., 2014). Commercial polyclonal goat anti-AtPIN1 (AP-20) was used at a concentration of 1:150 (Santa Cruz Biotechnology, Dallas, Texas). Affinity-purified Donkey Anti-Goat Dylight 549 secondary was used at a concentration of 1:200 (Jackson Immuno Research, West Grove, PA, USA). Control samples where the primary antibody was omitted showed a similar level of background signal as pin1-613 null mutant samples. The Plant Cell Online 27:20–32. Molecular Biology and Evolution 31:2042–2060. Methods in molecular biology 1223:17–33. Journal of Experimental Botany 66:5083–5102. Journal of Experimental Botany 61:3689–3696. Auxin Distribution and Plant Pattern Formation: How Many Angels Can Dance on the Point of PIN? Proceedings of the Royal Society B: Biological Sciences 207:79–109. Philosophical Transactions of the Royal Society B: Biological Sciences 295:461–471. The Plant Cell Online 3:677–684. Trends in Plant Science 10:170–177. The Plant Cell Online 12:507–518. The Plant Cell Online 8:735–746. Current Opinion in Plant Biology 21:51–58. Thank you for submitting your work entitled "Cross-species functional diversity within the PIN auxin efflux protein family" for consideration by eLife. Your article has been evaluated by a Senior Editor and three reviewers, one of whom, Dominique C Bergmann (Reviewer #1), is a member of our Board of Reviewing Editors. The following individual involved in review of your submission has agreed to reveal their identity: Dolf Weijers (Reviewer #2). Our decision has been reached after consultation among the reviewers. Based on these discussions and the individual reviews below, we regret to inform you that your work will not be considered further for publication in eLife. While all three reviewers through the topic was important and interesting, all felt that the key conclusions made in this study required additional experimental support (detailed in the comments below, but focused on what could be said with the heterologous expression system, concerns about interpretations of rescue of the different pin1 alleles, and feelings that better imaging was required to make statements about different BdPIN subcellular localization). The reviewers and editors do want to encourage you to submit this manuscript again once these key experiments, all of which should be technically feasible, have been done. In Arabidopsis, the single PIN1 protein has many roles. One fascinating, but confusing element of PIN1 polarization and auxin transport is that they are sometimes acting in "with the flux" way, and sometime "up the gradient". Making the critical observation that the Brassicas are unusual in having lost the sister of PIN1 (SoPIN1) clade, but that this is retained in grasses, O'Conner and colleagues test whether these two functions ascribed to Arabidopsis PIN1 might be separable in another species. This work is a nice follow up from modeling papers by the same authors and introduce what is potentially a powerful system for future studies. I liked where this was going, but found there were several areas where the conclusion outstripped the data and that different experiments could give them much more power to address the interesting questions. Major issues 1-4 are listed below. 1) Choice of Arabidopsis rather than native context has some limitations. To address the question of differential functions/duplications, this is obviously the right choice. However, when it comes time to discuss what these Brachy proteins do, interpretations must be more cautious. Given the capacity shown by this group and others to make transgenics and CRISPRs, more analysis in Brachypodium should be possible and would enable the authors to be able to say much more about the divergence in function between the Brachy proteins. 2) The AtPIN1pro-driven expression of the Brachy proteins showed clear differences between them, but the relationship between these patterns and AtPIN1pro was unclear. Is the broad expression of soPIN1 because the AtPIN1 promoter is actually expressed here and AtPIN1 is regulated at the protein level to be less? Or are there sequences in soPIN1 (genomic?) that are influencing expression in the heterologous system? 3) The relevance of the non-polar localization of Pin1b is not clear; is it aggregating or endosomal (i.e., does this represent a regulated difference)? The images are not clear enough to tell. In general, given the imaging capacities at SLCU and the fact that these studies were done in Arabidopsis, the image quality in close-ups should be higher. 4) The portion about differences in rescuing pin1-613 vs. pin1-4 is potentially interesting, but it is critical to ensure that it is the specific allele of pin1, not the absence of ERECTA that is responsible for difference in behavior. Second, does PIN1-4-GFP actually behave as predicted in the model? Can it be differentially recruited? O'Connor et al. describe a thorough analysis of the differences in function between two Brachypodium PIN proteins: SoPIN1 and PIN1b. Most research on PIn proteins has been performed in Arabidopsis, that O'Conner et al. previous showed to lack a specific subclade of PIN proteins, named SoPIN1. It was also previously shown that SoPIN1 and PIN1b have different localization patterns in Brachypodium, but it remained an open question whether there was a functional difference between the two proteins. Here, the authors generate CRISPR/Cas9 mutants in the SoPIN1 and PIN1b genes and show that SoPIN1 appears to represent the functional ortholog of Arabidopsis PIN1, while PIN1b plays a different, and more subtle role in development. Next, by using Arabidopsis wild-type and two different pin1 mutant alleles as a model, the authors show that the two proteins also behave differently when heterologously expressed. Again, SoPIN1 behaves more like AtPIN1, while BdPIN1b has different properties. This is in line with the finding that SoPIN1 is more effective at complementing a null allele of AtPIN1 than PIN1b is. The authors present several speculations on the basis for these differences. 1) The comparison of SoPIN1 and PIN1B in Brachypodium could have been developed further. Is the difference based on protein properties or does the pattern and level of expression contribute to different function? The authors raise this question, which can in fact be addressed in Brachyposium, but move to Arabidopsis to address it. The pin1-4 complementation assay in Arabidopsis suggests that both proteins can perform the same function in at least this context. It would be helpful if the authors complemented the sopin1 mutant with PIN1B driven by the SoPIN1 regulatory sequences. 2) The differential accumulation of SoPIN1 and PIN1b in Arabidopsis requires more explanation. First, the statements about subcellular localization could be better supported by high-magnification images. Second, the accumulation of SoPIN1 in the pith tissue is remarkable. Is the AtPIN1 promoter expressed there? Is this due to differential protein stability or are there cis-elements for expression regulation in the SoPIN1 coding sequence (as was shown for MP in Marcus Heisler's lab; Bhatia et al., Curr. Biol. 2016)? 3) The authors convincingly show that the two Brachypodium PIN proteins behave differently in Arabidopsis when expressed from the same promoter, but is somewhat unsatisfying that there are no indications as to the nature of these differences. Given that genetic materials are readily available, it would be good if the authors tested whether the different localization patterns are associated with altered trafficking or degradation. For both these properties, standardized drug treatments (BFA, wortmannin, MG132, etc.) are established, and even roots could be used since the proteins are expressed from the AtPIN1 promoter. 4) The interpretation of the complementation experiment in the pin1-4 background is somewhat problematic. It is presented as a distinction between a null allele (the Col T-DNA insertion; pin1-613) and a missense allele (pin1-4). However, since the pin1-4 allele is in a Landsberg background, an alternative explanation is that there are ecotype-specific modifiers that affect that ability of the different PIN1 homologues to act in Arabidopsis. This should at least be discussed as an alternative explanation. 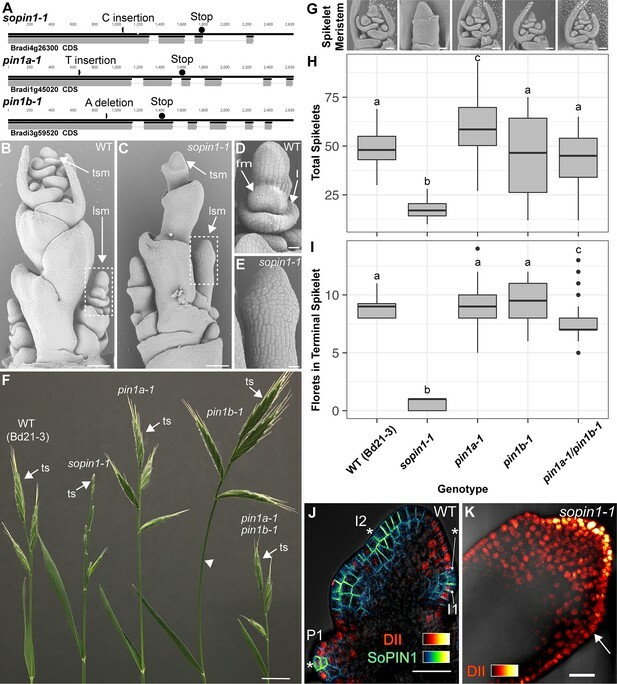 This manuscript by O'Connor and colleagues explores the functionality of proteins from two clades of PIN1-related transporters present in Brachypodium, PIN1 and SoPIN1, to deepen our understanding of PIN polarization processes and PIN-regulated patterning at the shoot apical meristem. SoPIN1 has been lost in Brassicacea and some of the authors (including the first authors) previously proposed that proteins form the two clades had different properties in their capacity to polarize in brachypodium while the unique PIN1 from Brassicacea would have evolved to have all the range of properties and/or functions shown by the two ancestral proteins. The manuscript includes a significant amount of work describing mutants in PIN1b and SoPIN1 in Brachypodium and the polarization patterns and phenotypes obtained upon heterologous expression in Arabidopsis. From the different phenotypes of the Brachypodium mutants and from the different capacities of the proteins to complement Arabidopsis pin1 mutants, the authors conclude that 1) the two types of PIN1-related proteins have different functions and 2) there might be functional differences although their Discussion clearly highlights the fact that their data are far from being conclusive on this aspect of the work. 1) As SoPIN1 and PIN1a and b have different patterns of expression, it is not such of a surprise that they would have different functions but showing it properly using mutant of Brachypodium would clearly be a strength of the manuscript. However only mutants for PIN1b have been obtained and the authors justify this by saying that PIN1a "accumulates at the site of vein formation after the organs begins to grow". Not only is this a limited justification for an absence of redundancy between these two close homologs of PIN1 but this statement surprisingly misrepresents published data from some of the authors showing that PINa is likely co-expressed with PINb in the vein before any sign of organ outgrowth (Figure 2E, F in O'Connor et al. PLoS Comp Biol 2014 and corresponding text stating that PINa and PIN1b are expressed starting from i1). Thus, the authors cannot conclude from the single pin1b mutant that "PIN1b is expendable for organ initiation" and this weakens the rest of the study. 2) The heterologous expression of PIN1b and SoPIN1 in Arabidopsis is an interesting strategy but also a dangerous one as little is known on the mechanisms of polarity in Arabidopsis and it is also not known whether any of the knowledge from Arabidopsis is valid in other species. The authors use translational version of the proteins with Citrine and nothing is said about the site of Citrine insertion. The site of insertion of a fluorescent protein is known to have the capacity to affect polarity of PINs (Wisniewska et al. Science 2006) and nothing tells us that the polarization capacities of PIN1b and SoPIN1 translational fusions are not affected by the insertion. Proving it would require proof that they polarize normally in Brachypodium and/or that they complement the phenotype. Along the same line, overexpression of PIN1 can affect its polarity (e.g. Figure 4C of Benkova et al. Cell 2003). This could explain some of the results observed with loss of polarity of PIN1b and SoPIN1. It could perhaps also explain why PIN1b is less polar – and also seen in what could be vacuoles – (Figure 5D) only when the endogenous PIN1 is also present. This and also the absence of knowledge on the stability of the proteins are some of the reasons that make the results presented very difficult to analyze. There are a few other reasons such as the number of transgenics that is somehow low (e.g. 7 lines expressing PIN1b under AtPIN1 promoter is not sufficient to conclude that it cannot complement pin1-6, especially when it can complement pin1-4). At the end and despite the amount of works it represents, the manuscript does not really bring new knowledge to the very complex problem of how PINs get polarized. Going beyond the simplest conclusion that is that PINb and SoPIN1 might have different activities and cellular properties seem difficult with the data presented. And even this conclusion is not entirely convincing when one consider the data from Figure 5 that show very nice polarization patterns towards flower initia with both PIN1b and SoPIN1. […] 1) Choice of Arabidopsis rather than native context has some limitations. To address the question of differential functions/duplications, this is obviously the right choice. However, when it comes time to discuss what these Brachy proteins do, interpretations must be more cautious. Given the capacity shown by this group and others to make transgenics and CRISPRs, more analysis in Brachypodium should be possible and would enable the authors to be able to say much more about the divergence in function between the Brachy proteins. We agree that more can be done in Brachypodium. We added pin1a single and pin1a/b double mutant analyses, which provide a more complete genetic dissection of the SoPIN1 and PIN1 clades in Brachypodium. Along with these additional mutant genotypes we have provided SEMs of meristem defects (Figure 1B-E) and improved quantification of mutant phenotypes (Figure 1H-I and Figure 2E). We have also added Brachypodium complementation experiments that show the previously published native reporters can complement the single-mutant phenotypes of sopin1 and pin1b (Figure 1—figure supplement 1 and Figure 2—figure supplement 1). Combined we believe these experiments provide a greatly improved analysis of the native Brachypodium protein functions. We have provided additional imaging of the native AtPIN1 reporter that shows early protein accumulation in pith tissue, suggesting that proAtPIN1 is at least initially active in the pith (Figure 3D, Figure 3—figure supplement 1D). Laser-capture micro-dissection and RNAseq performed in the lab of Thomas Greb has also detected abundant AtPIN1 transcription in the mature pith. These data suggest that proAtPIN1 does indeed drive expression in the pith tissue, and that AtPIN1 and PIN1b, but not SoPIN1, are cleared post-transcription. If there are additional regulatory sequences within the SoPIN1 coding region, which indeed includes introns and part of the 5’ and 3’ UTRs, we might expect these to drive SoPIN1 in the pith while under the proAtML1 two-component system, which we do not see. In addition, when we cloned the SoPIN1 and PIN1b coding regions we designed the primers to not include 5’ and 3’ conserved non-coding sequences, which might contain regulatory information. Despite this, we cannot completely exclude the genomic regions as sources of transcriptional information. We have added additional high-resolution close-ups of PIN1b subcellular localization in wild-type and pin1-4 meristems (Figure 6—figure supplement 3). While these images don’t necessarily provide a clear indication of where PIN1b is accumulating, they are at least consistent with PIN1b accumulation in either the vacuole or golgi, which may indicate a regulated response as has been shown for PIN2 in the Arabidopsis root. We have provided immuno-localizations showing that AtPIN1 protein accumulates in the pin1-4 allele, but not in the null pin1-613 allele (Figure 7). While the presence of protein in pin1-4 does not directly address the background effects between Col and Ler, it does provide a clear indication that the two atpin1 alleles are different, and thus could explain the difference in PIN1b complementation. We maintain that the dramatic difference in PIN1b localization between wild-typeand pin1-4 within the Ler background further suggests that the atpin1 mutant allele is the most likely explanation for the differential complementation. That said, we cannot completely discount background effects, including erecta, which has known effects on PIN1 localization. We have added an expanded discussion of the potential for background effects to the Discussion section (subsection “Transport activity”, last paragraph and subsection “Interaction”, first paragraph). In addition, we have begun several new experiments to directly address background effect, and erecta, but these will take a significant amount of additional time. While Brachypodium is indeed more experimentally tractable than other grass models, especially in regards to transgenics, it is far more cumbersome than Arabidopsis. We intend to continue to use both models in the future, and certainly additional experiments in Brachypodium are necessary, including cross-complementation between the clades as the reviewer suggests. The complementation of the sopin1 and pin1b mutantsby their respective native reporters, which has been added to the revised manuscript (Figure 1—figure supplement 1 and Figure 2—figure supplement 1) provides important groundwork for these future experiments as it shows that the fusion proteins are at least functional in their native contexts. In the present manuscript, we felt additional genetic analysis with pin1a mutants was far more important, especially considering likely genetic redundancy in the PIN1 clade. We hope to be able to report more results in Brachypodium in the future. As described above, we have provided high-magnification images of PIN1b subcellular localization in both wild-type and pin1-4 (Figure 6—figure supplement 3). We have also provided imaging evidence that AtPIN1 is indeed initially expressed in the pith tissues, suggesting that AtPIN1 and PIN1b are cleared post-transcriptionally while SoPIN1 is not. At this time, we cannot address the nature of what features account for this differential accumulation, but this will be an important avenue for future research. Most drug treatments are indeed standardized for analysis in the root. Unfortunately, we have found that the concentrations of drugs that are effective in the root are not necessarily effective in the shoot (BFA for example), making use of these drugs in the shoot context problematic. Roots could be used for these experiments as the reviewer suggests, but it would be hard to relate results from the root to the functional assays we present here which are focused on the shoot. It is indeed a limitation of the present paper that we cannot explain the nature of the differential behaviors, however, the functional analyses established in the present work will provide ample material to address these differences in the future. We agree that the role of genetic background cannot be completely discounted. We added an expanded discussion of possible background effects to the Discussion section (subsection “Transport activity”, last paragraph and subsection “Interaction”, first paragraph). However, as outlined in the Discussion we believe that the dramatic change in PIN1b localization within the Ler background suggests differences in the pin1 mutant allele as the most likely explanation for the differential complementation. We completely agree that the lack of a pin1a mutant, and the likely genetic redundancy between PIN1a and PIN1b was a limitation of our previous manuscript. As described above we have added single pin1a as well as double pin1a/b mutant analyses (Figures 1 and 2), providing a more complete analysis of SoPIN1 and PIN1 clade function in Brachypodium. The lack of an organ initiation phenotype in pin1a/b double mutants provides support for the idea that the SoPIN1 and PIN1 clades have substantially different roles in Brachypodium. 2) The heterologous expression of PIN1b and SoPIN1 in Arabidopsis is an interesting strategy but also a dangerous one as little is known on the mechanisms of polarity in Arabidopsis and it is also not known whether any of the knowledge from Arabidopsis is valid in other species. The authors use translational version of the proteins with Citrine and nothing is said about the site of Citrine insertion. The site of insertion of a fluorescent protein is known to have the capacity to affect polarity of PINs (Wisniewska et al. Science 2006) and nothing tells us that the polarization capacities of PIN1b and SoPIN1 translational fusions are not affected by the insertion. Proving it would require proof that they polarize normally in Brachypodium and/or that they complement the phenotype. Indeed, proving that the Brachypodium fusion proteins are functional is an important experiment. We have added experiments where the sopin1-1 and pin1b-1 mutants are complemented by the previously published native reporter lines, demonstrating that the fusion lines are indeed functional. In addition, the expression and polarization dynamics observed in Brachypodium were validated by immunolocalization experiments performed using SoPIN1 and PIN1 antibodies in maize (O'Connor et al. PLoS Comp Biol 2014). As indicated in the Materials and methods, for each Brachypodium PIN-CITRINE fusion construct, the entire PIN coding region, including the CITRINE insertion, was amplified from the previously published reporter constructs (O'Connor et al., 2014). The methods now state that the FP insertion position is the same used in AtPIN1-GFP lines already shown to functionally complement pin1 mutants (Heisler et al., 2010; Wisniewska et al., 2006; Xu et al., 2006) (Lines 754-756). Along the same line, overexpression of PIN1 can affect its polarity (e.g. Figure 4C of Benkova et al. Cell 2003). This could explain some of the results observed with loss of polarity of PIN1b and SoPIN1. It could perhaps also explain why PIN1b is less polar – and also seen in what could be vacuoles – (Figure 5D) only when the endogenous PIN1 is also present. This was precisely our motivation for using the two-component system, which is far less susceptible to position-effect variation of expression level. There is no doubt that expression using this system could be described as “overexpression”, but it is at least consistent between the lines that express SoPIN1 and those that express PIN1b. So, while both proteins are “overexpressed”, only PIN1b shows intracellular accumulation while SoPIN1 tends to be more stable on the membrane. This a very artificial system, but it acts to highlight the differential behaviors of the two proteins, which is our primary goal. This and also the absence of knowledge on the stability of the proteins are some of the reasons that make the results presented very difficult to analyze. There are a few other reasons such as the number of transgenics that is somehow low (e.g. 7 lines expressing PIN1b under AtPIN1 promoter is not sufficient to conclude that it cannot complement pin1-6, especially when it can complement pin1-4). We believe that 7 lines expressing PIN1b where we can observe abundant PIN1b protein in the pin meristem is sufficient to conclude that PIN1b cannot complement pin1-613. We screened additional lines for complementation, but did not perform microscopy to validate that PIN1b was indeed expressed, which is an important test. At the end and despite the amount of works it represents, the manuscript does not really bring new knowledge to the very complex problem of how PINs get polarized. Going beyond the simplest conclusion that is that PINb and SoPIN1 might have different activities and cellular properties seem difficult with the data presented. And even this conclusion is not entirely convincing when one consider the data from Figure 5 that show very nice polarization patterns towards flower initia with both PIN1b and SoPIN1. We believe that providing ample evidence that the SoPIN1 and PIN1 clades are functionally different is a worthy goal because it provides functional assays for future studies on how PIN polarization is controlled. We agree that this is a very complex problem, but the complexity only acts to reaffirm that subtle differences in PIN function may offer a way to understand the differential polarization dynamics between clades, and in turn how PINs respond to auxin. Our work adds complexity to an already complex problem, but it also adds new trajectories for future work. Thanks to Raymond Wightman for SEM assistance, Martin van Rongen for assistance with transport assays and pin1-613 oligos, Tom Bennett for proAtPIN1 oligos, Marcus Heisler for AtPIN1-GFP construct and pin1-4 genotyping assistance, Teva Vernoux for DII plasmids, David Jackson for maize codon-optimized Cerulean and to all the members of the Leyser lab. Thanks also to Graeme Mitchison, Katie Abley, Michael Raissig, and Pau Formosa-Jordan for helpful comments on the manuscript.